Fast processing of any type of multibeam data! With this optional Add-On to AutoClean it is possible to directly import RAW Multibeam Echosounder files and quickly reprocess the data to survey results on any survey datum. All input parameters, Vessel and System Configuration, Sound Velocity Profiles are extracted from the raw data and can be further modified as required. The blazing fast multi-threaded reprocessing utilizes full launch angle calculation and sound velocity ray tracing leading to very accurate footprint results. User interface is kept to a strict minimum which assists novice users. Kongsberg All + KMALL, XTF, Hypack HSX, Teledyne Reson PDS, WASSP, GeoSwath RDF, BeamworX RAW (NavAQ). Further can be added on user request. A flexible editor allows to setup how the data is to be calculated: which systems are used and their offset/latencies etc., how heights are calculated (RTK Height or Tide), Sound Velocity Profiles, depth blocking gates etc. 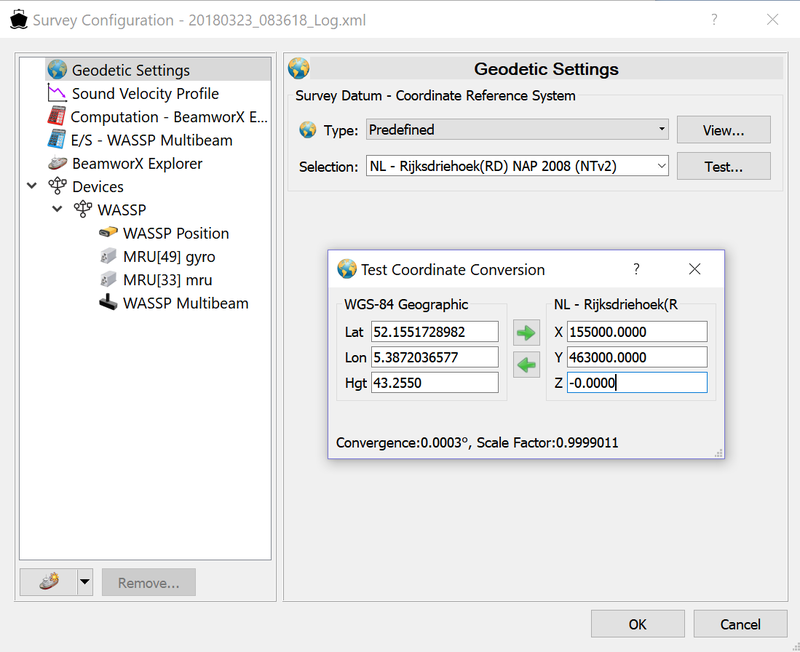 BeamworX software supports full geodetic calculations from GPS positions to projected survey datum including grid shifts, Geoid models, WKT/EPSG/Proj4 import. Instead of using the position/motion data from the RAW files it is also possible to read this data directly from post-processed track files, e.g SBET or ASCII files. The Raw position and motion data can optionally be extracted from the Raw Files and manually and automatically edited. The results can be saved to a post-processed track file. Above an Example of post-processing of Bad GPS Positioning under bridge. 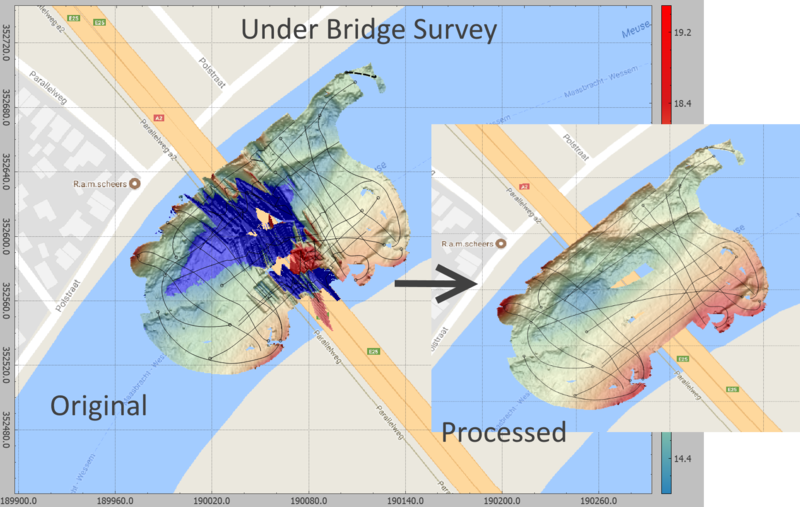 Below an example of how to re-process multibeam data under a bridge. Contact us for a demo and pricing.